Full disclosure, I’m playing the Japanese disc version of Parrapa on the PS4, which is a port of the PSP version. I’m still playing it as a retrospective as, let’s be honest, Parappa isn’t the sort of game that greatly benefits from a lick of HD paint. I shall pretty much be ignoring any upgrades (not hard to do) and just seeing how the game plays all these years later. Even on a differently numbered console. I could have lied and said I was playing on the PS1, but I’d never do that to you dear reader. And I’d have to go and buy a copy. I feel owning the Japanse and UK versions on the PS4 as well as the PSP version is more than enough. Anyway. Parappa the rapper saw a western release on the PlayStation 1 in 1997 (for once Europe got it earlier than the US). It stars a dog named Parappa who is trying to win the affections of a flower named Sunny Funny. To do this he does what every person (dog) in his shoes would do. He raps. Obviously. As a rhythm action game, the player must press the corresponding button at the correct time to pass the level. 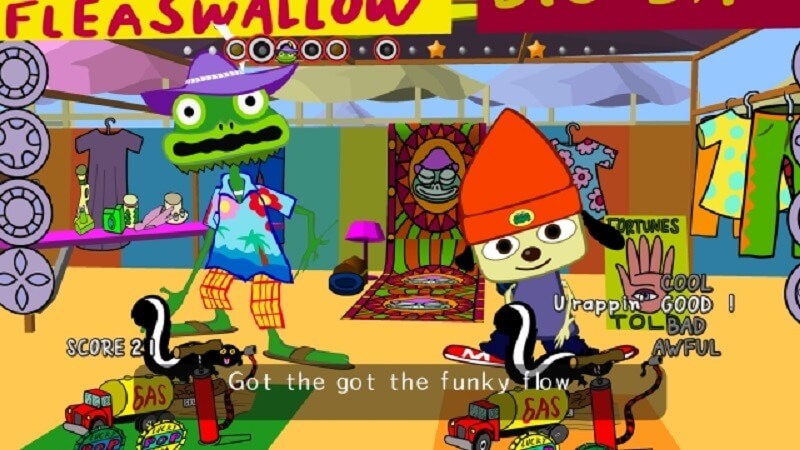 Each level has a different teacher who raps a line and Parappa must follow with his own rap, helped by the player button presses. There are only a handful of levels, but each has enough variation and enjoyable lyrics to warrant multiple playthroughs. Parappa is taught martial arts by an onion, he’s taught to drive by an anthropomorphic Moose. There’s even a level based on waiting in line for the bathroom which includes the line “kick, punch, turn and chop the door. Or I will fall to the floor”. 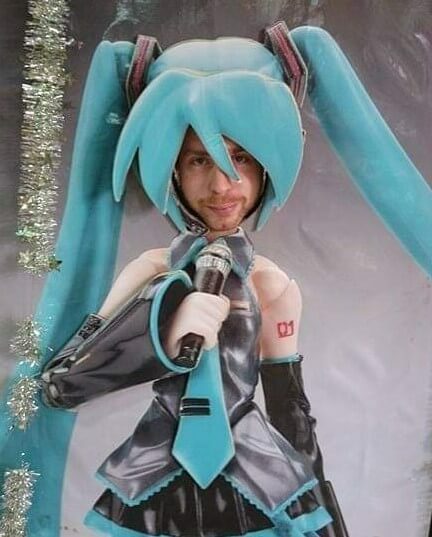 The characters and lyrics are great. I’d have no problem playing through these levels countless times. I love all the raps and all the levels. Mostly. Before playing Parappa I was considering becoming a vegetarian. After playing the cooking level over and over again I’ve decided I want to eat as many chickens as possible. I still wake up in cold sweats hearing M.I.X the flour to the bowl. I think part of the problem with this level actually is the ported version (I said I wouldn’t mention it). I don’t remember having any issue with it at all back in the day, and it seems a number of people have had issues with it on the PS4 version. The accuracy of button prompts and the timing required seem to be pulled out of thin air. That level aside I didn’t have any problem with the game and I managed to breeze through. Most musical games will reward players for accurate button presses in time with the music while punishing them for missing or mistiming notes. Parappa is different. 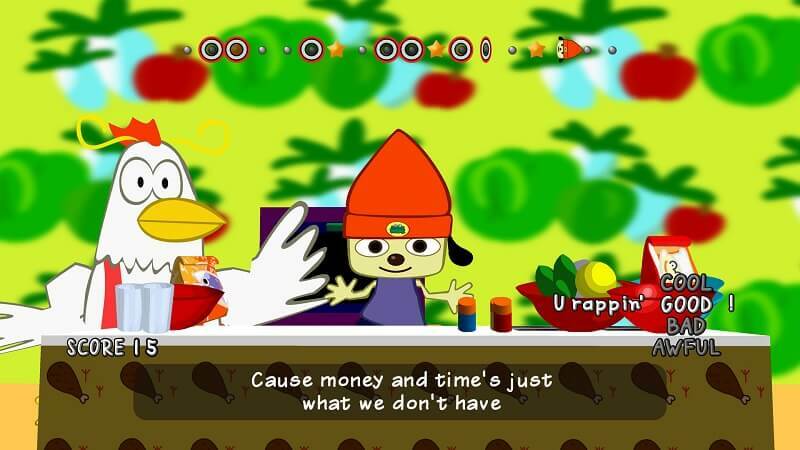 Of course, the aim of the game is still timing your button presses to perfection (even if the game doesn’t realize they are perfect, stupid chicken), however, Parappa wants the player to do their own thing, as long as they are following the beat. The bottom right of the screen shows the player rating for the level. A GOOD rating is needed in order to pass the level. The lower two ratings of BAD and AWFUL will see you failing the level and having to retry. Getting to the bottom of the ratings during the level will cause an instant game over and force you into retrying. The highest rating is COOL and here’s what I mean about doing your own thing. To get the highest rating requires going off script. Basically adding in extra button presses whilst trying to follow the flow of the song. Reaching COOL will see the master of the level disappear as they have taught Parappa everything he needs to know, so he is left to his own devices. Parappa appears to be in some kind of zen state whilst on a COOL rating. Rapping anything he wants to keep the score up and not drop down. What all this really means is mashing the hell out of the buttons. Trying to keep with the rhythm but in reality looking like a 5-year-old trying to beat their older brother on Street Fighter. The sad thing is the button mashing will probably be successful in both cases. I’d have preferred to have felt a bit more in charge of the song and not like I was playing International Track and Field. 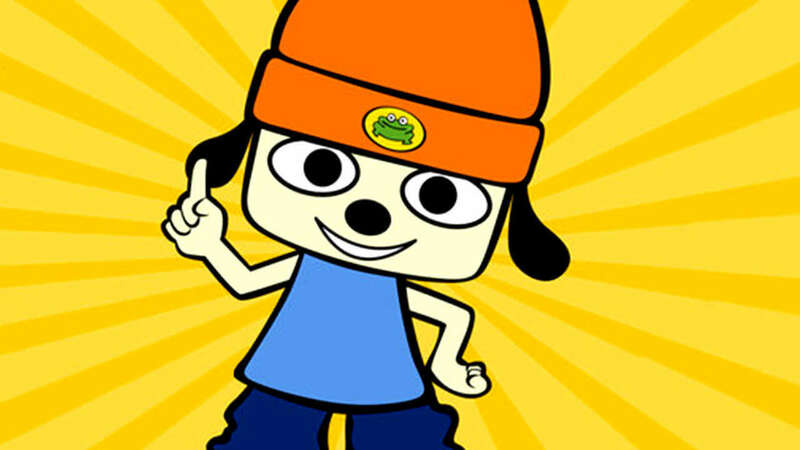 I’m not going to complain though as I’ve really enjoyed my time with Parappa again and there’s not much more to say about it really, but don’t let that put you off. It’s a short but sweet rhythm game with great songs and plenty of fun. There’s no extras or much in the way of bells and whistles. It is what it is. Silly fun. Sure, there are issues with the PS4 version, though I’d still recommend anyone to give it a try. And once you’re done there’s still the sequel to play. Parappa 2 is vastly inferior to play, unfortunately, however, you can’t go wrong with the spin off Um Jammer Lammy. Here’s hoping for a remaster of that, it’s wonderful. What do you guys think? 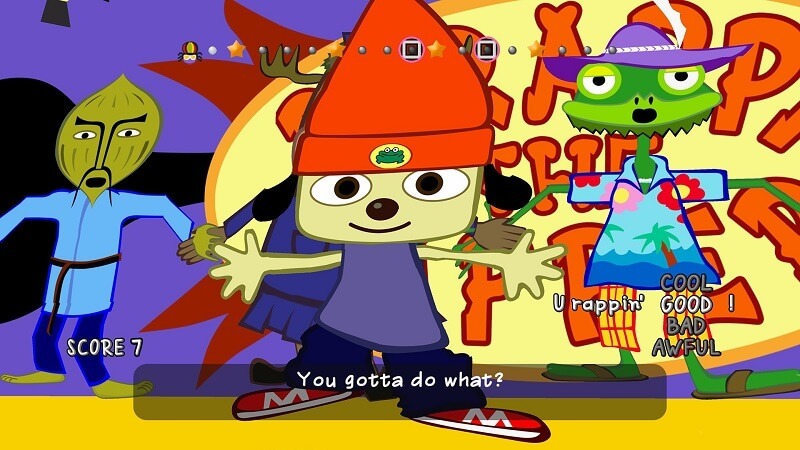 Have you played Parappa or did it pass you by? Or most likely, did you play the first level on the PS1 demo disk?